Natural Bee Pollen | Complete Nutrition | Springtime, Inc.
A "miracle food" that supports energy needs, muscle strength, and digestion. 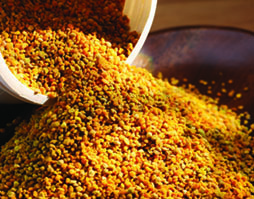 Springtime Bee Pollen - bright and fresh, clean and good tasting! All the bee pollen that Springtime supplies is carefully selected for purity and flavor. We search the hardest for the batches we use for people pollen, and we also set aside batches that are particularly colorful, as well. Even after 30 years in the business, it is still a thrill to see a unique new batch. You probably won't get the same thing twice, but you will get something good every time. per 100 lb. of body weight daily. Highly recommended 1 or 2 hours before workouts. Pollen contains greater concentrations of living enzymes than any other part of the plant. Scientists state that enzymes are absolutely essential for every biochemical function of the body. Enzymes are perhaps the most important of the health-giving plant factors. They are completely destroyed by high temperatures (130 degrees) – cooking! Enzymes are the essential triggers for the metabolic machinery of every living organism. The enzymes in raw foods are important because they help support the body's own enzyme systems. Enzymes are the life principle of every living cell. Bee Pollen has been our business for over 30 years. We choose batches that are bright and fresh, properly dehydrated, good tasting and clean. When received, we test each batch thoroughly for pesticides, heavy metals, biological contaminants, and more. Pesticide testing covers 132 different types, and our raw materials must pass each and every test or we will not allow it into our products. The testing process generally takes up to 30 days to perform, and there are very few companies in the industry that go to these lengths! Reserve inventories of Bee Pollen and Spirulina are stored in sub-zero frozen storage to maintain highest potency! Kawahinealoha (no. 3) blocking a shot for the Orange County College Pirates. "I can't believe the results!" 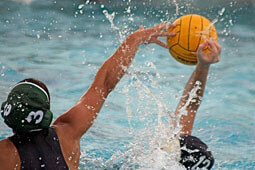 I play college water polo, and we have long practices. A few athletes I know recommended Springtime Bee Pollen to close any nutritional gaps in my diet. I can't believe the results - I am very happy with this product!